Europeans agree — assisted GNSS or A-GNSS provides the best means for locating emergency callers using mobile phones. Although the question of who should pay is remains to be answered, new regulations aimed at enabling the service now seem inevitable. In fact, says Donna Reay of the European GNSS Agency (GSA), many people have the false notion there is already such a system in place in Europe. As it happens, most European Union (EU) member states still depend on accurate reports of location by the callers themselves. In the best cases, cell-ID-based solutions are employed, delivering positioning accuracy typically greater than 500 meters, and in extra-urban areas ranging from 20 meters up to tens of kilometers. Crucially, locating callers under these circumstances can entail significant delays, when minutes and even seconds could mean the difference between life and death. A-GNSS–based technologies use information from the cell network to provide quick localization of a caller — to within meters in dense urban areas. When it comes to outdoor positioning, especially in unobstructed rural areas with low mobile phone cell density, stand-alone GNSS has an overwhelming advantage in accuracy. The term “assisted-GNSS” in this context simply implies the use of multiple constellations — GPS, GLONASS, BeiDou and/or Galileo. Adrian Stimpson of Canadian company RX Networks, which provides A-GNSS data assistance to the majority of U.S. mobile network operators for their e911 services, said his company has seen significant increases in accuracy when including the four operational Galileo satellites in orbit, especially in urban canyons and indoors. The debate seemed to be over before it started. Most agreed the final configuration of the EU service should include a combination of GNSS location data along with input from cell ID, Wi-Fi, and any other available technologies to help increase availability and accuracy, particularly as most emergency calls still do come from urban and indoor locations where GNSS may not work as well or at all. No one seemed to have a clear set of figures on how many lives could be saved with e112. Kautz says the commission is carrying out an impact assessment that will shed light on that question – but most everyone believes the number is high. 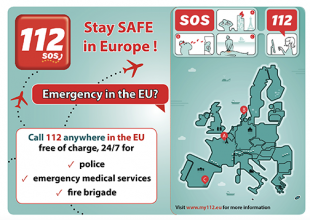 Gary Machado of the European Emergency Number Association (EENA) put the potential economic benefits in the billions of euros, based on calculations where a minute’s delay in emergency response has a monetary value of €1,300. “Our conservative estimate shows €3.9 billion lost every year, in addition to the material damages and, of course, the incalculable value of lost lives,” he said. The benefits may be clear and obvious, but the way forward will not be without hitches. As Cristina Lumbreras, also of EENA, pointed out, today the existence of 28 EU member states means 28 different ways of dealing with emergency calls. In some countries, police services receive these calls. In others, it’s the fire department. Some have dedicated call centers, with highly trained staff, computers and sophisticated dispatching systems. Others use landline telephones, notepads and fax machines. Richard Webber of the East of England Ambulance Service discussed the issue of language. 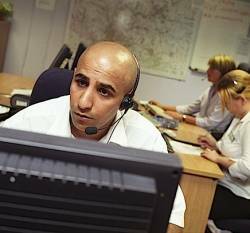 Emergency services in the UK routinely receive calls from non-English speakers, and while multilingual staff are available, the person who receives the call is not always able to determine immediately what language the caller is speaking. To drive the message home, participants introduced into evidence a variety of “horror stories” – documented cases where callers who could have been located quite easily had GNSS been available waited for hours, even days, and in some cases died while their would-be rescuers tried to find them. The purpose of the public hearing, said Kautz, was to gather insights and contributions from stakeholders. It came as a new EU directive on “The harmonization of the laws of the Member States relating to the making available on the market of radio equipment” is about to come into force. The directive empowers the European Commission to issue decisions or “delegated acts” specifying which categories or classes of radio equipment are covered by these essential requirements. And that means, if we all agree, mobile telephones. Speaking at the hearing, Javier Arregui of the EC DG Enterprise and Industry, explained that a delegated act is automatically adopted if the European Parliament and the European Council do not object within two months. So, with such objections being rather bothersome to mount, the commission looks to be pretty much in the driver’s seat. Thales Alenia’s Gagnon addressed the question of whether such a mandate was necessary. Thus, he argued, any regulation should not be too specific in terms of technologies and performance but should look more like a set of guidelines, leaving the details to the engineers and developers. With everyone apparently in full agreement that mandated GNSS is the way to go, the deal seemed virtually sealed. Who could possibly be against it? “The mobile network operators, of course,” observed Monnerat. The Qualcomms, the T-Mobiles, the Telefonicas, will have to develop something, find solutions, deploy, put 112 capabilities in handsets. But if the benefits are so clear and massive and widespread, shouldn’t the costs be spread around, too? Why should the operators alone have to foot the bill? As an aside, independent GNSS consultant Hans de With notes that the same questions have been asked in the European small-airport community with respect to the setting up of new EGNOS-based landing procedures. The EU incessantly lauds the wide-ranging economic and societal benefits of GNSS for aviation, but the costs seem to be more selective in terms of where they fall. Kautz assured all, including some wary-looking representatives of European mobile network operators, that no decisions had yet been made and that the hearing had been called precisely to get everyone’s views on the matter. Other participants at the hearing seemed to be in sympathy with the operators. Gagnon said he agreed that mobile phone companies should be compensated in some way for their efforts. Could this mean the EU doling out money to help network operators get the system up and running? Stimpson reported that in Canada, mobile network consumers now pay 75 cents a month to offset the cost to operators of emergency caller location services. A pretty straightforward solution, and no one seems to be complaining about it, he said. But the question of funding for the massive effort that will be needed to get the whole EU28 on the same page could end up being a sticking point, setting up some touchy and potentially time-consuming negotiations before anything can really happen. Technology, on the other hand, is not a problem. The GSA’s Justyna Redelkiewicz said the chipsets that will enable the service are ready to go. Earlier this year, STMicroelectronics announced that its Teseo II single-chip satellite-tracking IC was ready for testing for the eCall service. That’s Europe’s new initiative for automatic emergency calls from light vehicles in case of accident.